New book day is always a good day at Alchemist HQ and this haul was substantial. Thirty or so strong, no less. I shall endeavour, to the best of my limited and broken abilities to break down the mighty stack into tasty, bitesize chunks, approximately or even exactly three morsels at a time. Flight-in-the-wind sized treats are served. We’ll begin with John Champ’s book which, in reality, is not the most helpful of books. As one who does not yoga - on even a daily basis - I can only imagine and surmise that ‘Yoga For Men’ may not really be about yoga or even exercise at all, at least not in the traditional or decorous sense. However, it does make for a most stimulating read and - in a world where yums are absolutely a thing and very much allowed - I’m going to say that both in 1978 and now, that might just be enough. It’s bloody good fun if your boat is even slightly rocked and I’m okay with that. 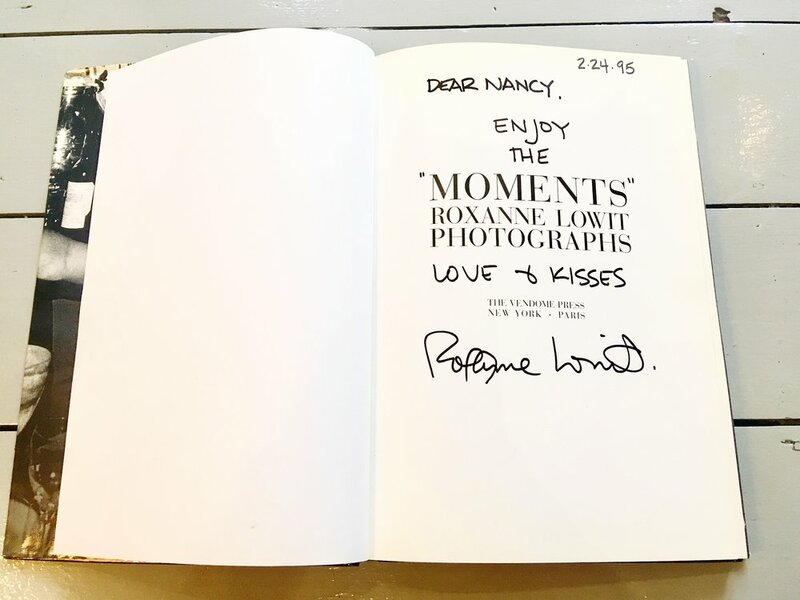 ‘Moments’ by Roxanne Lowit was the best kind of surprise. I mean, I knew I would love it because it has photos of Dali being Dali with Janet Daly in Restaurant Laurent, New Years Eve, 1979 (I came to love that man by proxy via Mistress of The Immortal Hunger) but I’m not sure that anyone on the receiving end of cash had ever clocked the title page inscription: As a memoir of the 1980s and the whole Studio 54 crowd, the book is win after win, page after page. As an artefact and inherited gift, it’s totally a thing that has fallen through time and I’m most grateful to have caught it. Also, the texts held within are by none other that Yves St. Laurent, Karl Lagerfeld and Grace Jones, to name but a few. The council rests. Finally, ‘Rock Stars In Their Underpants’ is exactly what it purports to be and that makes it one hundred percent amazing. Paula Yates’ musical drawers are very funny, very tongue in cheek and…illuminating? Both Bob Geldof and Frank Zappa are most impressive (yes, in that way), as are Lemmy Ace Of Spades and Ted Nugent. Bowie/Ziggy and Elton John’s shots might be a little too close for comfort and I’m not certain that we needed those particular angles? As for McCartney, I think there might be such a thing as cheating here. Challenge what you think you know about one of the most important disciplines of our time in the first exhibition of its kind to explore the design and culture of contemporary videogames. Follow the creation of ground-breaking works from the last decade to see how a new generation of designers and players are pushing boundaries. Everyone I speak to has been to the video game thing at the V&A, which is nice because I can actually respond in kind as I took The Mothership to see all their stuff last week. 'Videogames: Design/Play/Disrupt’ is a great time and I think she had a better one of those than she thought she would. The V&A has always had the correct amount of delight and surprise dialled in, seemingly on tap and should be given their due, unseated ovation. They cover everything from concept, through the design phase and technical side of things, all the way to the eventual socio-political ramifications of video games as a creative, developing art form. That’s what the sign said anyway and also something about ‘operas made out of bridges’, which is one of those seminal sentences we should all be expected to craft for the benefit of others. In terms of games on show, they cover a pretty broad spectrum from the uber-indie side of things, scaling all the way up to AAA territory. I spent some time with ‘The Last Of Us’ because I’ve always been a sucker for story and those mo-cap suits for the actual voice actors were kind of a legitimizing force at the time. ‘Bloodborne’ is also interesting from a mechanics perspective and that orchestral score is just bonkers. Everyone seemed to love the section on ‘Journey’ because, admittedly it is crazy pretty to look at but personally, ‘No Man’s Sky’ ticked all my boxes in terms of the technology at work, that 80s sci-fi novel cover asthetic and 65 Days Of Static’s incredible procedural soundtrack. There is also the obligatory hands on time at the very end, right before their little shop. It’s very interesting although perhaps not quite as primetime as ‘Digital Revolution’ which was on at the Barbican a few years ago. Now that I look at it, that was 2014. Time is wierd. Still, if any of the above appeals to you - and I kind of think it does/would/should even if you don’t think you normally dig that thing - then you have ample time to catch it until the end of February. If only so as to silence the desperate crowds, I shall here share a couple of photos from recording, snapped prior to the Mexican break. They were all taken in studio which is, as promised, very much a crypt. Mr Tim - engineer extraordinaire - has plenty of nice toys, including the most wonderful of compliments to my own armada. My candy apple red, American Standard 2008 Fender Telecaster. A big six string bass that was utilised for the most gnarly baritone feedback you’ve never heard. My circa 1962 Guyatone Teisco-like, with finicky light switch pickup selectors. A 1960s Fender Jaguar with DIY spangly paint job. A very green guitar with more buttons than God, known only as a Bullfrog that may have spent some time with every string tuned to E for reasons. My 2015 MIJ, Daphne Blue Fender Mustang, complete with tortoise shell pick guard. A Gibson 1935 ebony L-30 arch top acoustic called Jasper, who really remains far too beautiful for words. My name’s Jon and - if we’re keeping things simple here, which I think is advisable for the most part - I play guitars. Sep 16 Maya Have More?